035a – Excalibur | All Eighties Movies. All The Time! 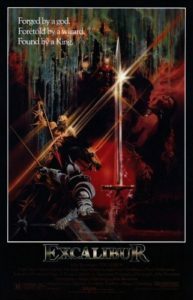 This week we go back to 1981 for the greatest King Arthur movie of them all! A movie so big that we decided to make it a double episode full of chrome covered knights, epic battles and some very funny lines from the greatest Magician in history – Merlin! Also, we may reference Monty Python and the Holy Grail. Just a little bit. This entry was posted in Podcasts and tagged action, drama, fantasy. Bookmark the permalink. This was my favourite versions of this story although not accurate I still think it showed full respect to the tale as you both did. Can’t wait for part 2 and cannot judge you for including Monty Python and the Holy Grail. For a serious movie I did laugh. Will be always fan of your podcast. You both show respect and still have fun. Love it. i’m over from twitter from Gidgit talking about u did this movie. Listening to prt 1 and loving so far. Promise to cheque out more podcasts from you both. OMG the facts u both know is blowing me away. Forgot to say this is 1 of my favorite eighties movies. So gothic can you tell me any more gothic eighties movies pls? Laughed so so much at you both taking the Auzzie stand on this movie. Came here from twitter and had no idea you both pod casted this movie! I’m laughing at a non comedy movie so credit to you both. Everyone should listen to Excalibur pod casted by Angry and Gidgit. THIS should be played at high schools. Dying laughing.